During one of the most profitable quarters of the year for North American carriers, Virgin America continued to record a string of quarterly losses, watching its 3Q2012 net loss widen year-over-year from USD3 million to nearly USD13 million. In its latest effort to stem its continuous losses for the last five years, the carrier has now embarked on plans to cut its orders for current generation Airbus narrowbodies and defer deliveries of the A320neo as a means to slow its annual capacity growth to the single digits during the next several years versus a 73% expansion during the last two years. While the changes to its Airbus orders supplies Virgin America breathing room with its capital commitments, and its new-found slow-growth mode gives some of the new markets it has introduced during the last couple of years time to mature, it is not clear how Virgin America will undertake one of the single biggest challenges it faces in achieving profitability – building and maintaining a viable network to compete effectively against carriers that are cleaning up their own balance sheets and posting consistent profits. Virgin America became the North American launch customer for the Airbus A320neo when it unveiled plans to purchase 30 of the new engine option jets and 30 current generation A320s in Jan-2011. At that time the carrier lauded the order that would allow it to triple its fleet size with 60 aircraft. Nearly two years later as its financial performance continues to lag as evidenced by a 2011 net loss of USD100 million, Virgin America has cancelled orders for 20 of the current generation Airbus narrowbodies, and will receive the 10 firm orders from 2015 to 2016. The carrier will take delivery of a single aircraft in 2013, which will result in a year-end fleet of 53 aircraft. 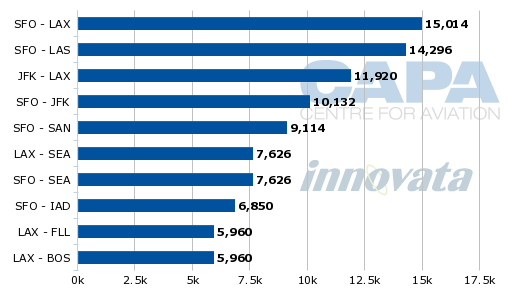 The carrier is deferring deliveries of the 30 A320neo jets from 2015-2016 to 2020-2022. While slowing growth and cutting down on financial commitments for aircraft are prudent moves, Virgin America also needs to make structural network adjustments to attain long-term revenue benefits. The carrier’s top line revenues grew 27% year-over-year to USD368 million, but the 28% rise in expenses outpaced revenue growth, triggering its operating losses. The reality is Virgin America faces significant challenges in building up a strong passenger base with enough scale to take its revenue generation to the next level. At its top base of San Francisco (its home base and headquarters), Virgin America represents a distinct second behind United Airlines with an 11% seat share. 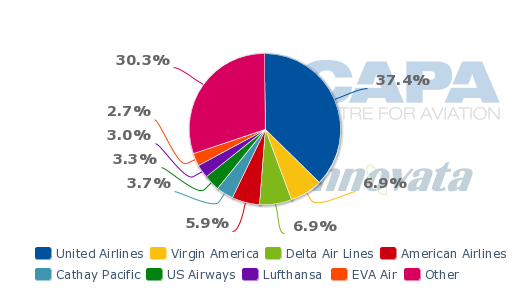 On an ASK basis, Virgin America represents only 7% of the seat kilometres deployed to/from San Francisco, tied with Delta for second behind the 37% ASK share held by United. Virgin America’s second largest base is Los Angeles, which is highly fragmented. On a seat basis, Virgin America represents just 6% of the seats deployed from the airport, fifth behind American, United, Delta and Southwest. 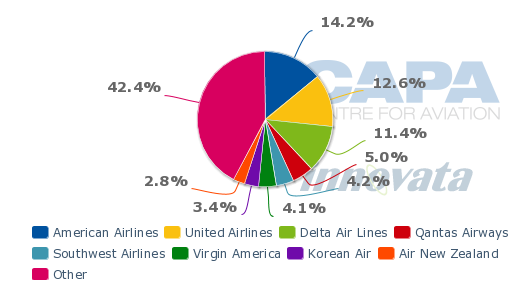 Based on ASKs, Virgin America is the sixth largest carrier at Los Angeles, representing just 4.1% of the seat kilometres deployed to and from the airport. 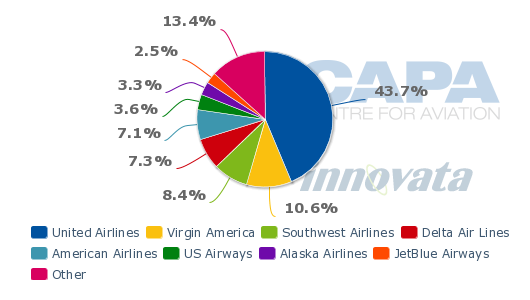 Based on schedules in Innovata for the week of 18-Nov-2012 to 24-Nov-2012, Virgin America has a commanding share in terms of seats on only one of its top 10 domestic markets – the lower yielding market of Fort Lauderdale. In several of the markets, Virgin America’s seat share is either third or fourth. On three of its top 10 markets, Virgin America is one of five airlines operating on the route, while another three of its top markets features four carriers offering flights on the pairing. 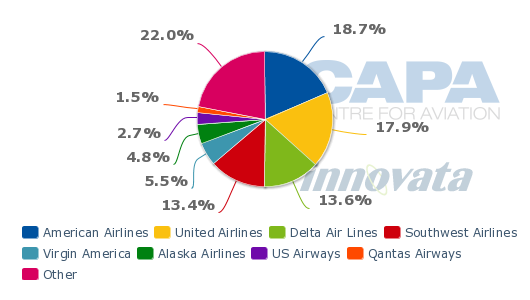 Only a single market has two carriers – San Francisco to Washington Dulles – with United commanding a 74% share. In nearly all of its top markets Virgin America faces competition from legacy carriers and other low-cost carriers including Southwest and JetBlue, which creates formidable challenges for Virgin America in using its often touted lower fares to capture a significant number of passengers from the legacies while attempting to compete on price with its low-cost rivals. Virgin America and JetBlue also have similar product offerings, supplying customers with a mix of up-sells including JetBlue’s Even More Legroom and Virgin America’s First Class, so it is tough for Virgin America to compete on product distinction. Another challenge Virgin America faces is luring entrenched business travellers and frequent flyers away from its legacy competitors. A recent promotion launched by Virgin America targeting elite level flyers of legacy carriers American and United for a status match programme in its own loyalty scheme, demonstrates the hurdles Virgin America faces in the mix of competitors operating on its most travelled routes. During the 12 months ending Sep-2012 the five markets introduced by Virgin America continue to reflect its challenge of building scale and utility across its network. It also shows the carrier suffers somewhat from an identity problem, evidenced by service introduced from San Francisco to Puerto Vallarta, Mexico. Those flights joined existing service from Los Cabos to San Francisco and Cancun to San Francisco to Los Angeles. 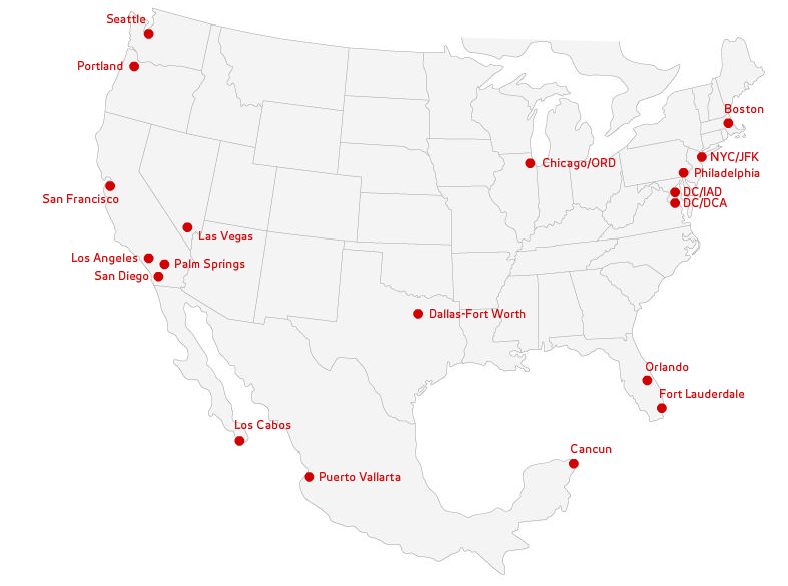 Those are Virgin America’s only international markets and reflect a small scope within its network targeted toward leisure passengers, joining the primarily leisure markets of Fort Lauderdale and Orlando. The carrier’s limited presence in leisure markets does little to create a foundation to sufficiently grow revenues to create sustained profitability, and likely deflects time and resources away from the carrier’s attempts to build up a more lucrative corporate base. Similar to its top domestic markets, Virgin America commands a leading seat share in only one market – San Francisco-Washington, DC – in the five markets it has introduced during the last year. Its share on flights from San Francisco to Puerto Vallarta is third behind Alaska Airlines and United. Virgin America also trails behind two other carriers on flights from San Francisco to Palm Springs and between San Francisco and Portland. Its major competitors on most of the new markets are Alaska and United, two entrenched carriers on the US west coast with established customer bases. As is the case in its competition with legacies and Southwest and JetBlue, Alaska is also a low-fare competitor that creates challenges for Virgin America to compete effectively in its markets on price alone. Since its 2007 launch Virgin America has consistently touted its distinct product and lower fares that would lure passengers away from its legacy competitors. But its failure to deliver an annual profit over five years warrants a re-evaluation of its business plan. Denver-based Frontier Airlines, beginning in 2011, undertook a network overhaul that included shuttering hubs in Milwaukee and Kansas City, redoubling some of its efforts in Denver, but more importantly, testing out some small focus markets largely shielded from legacy competition. At 56 aircraft Frontier has a similarly sized fleet to Virgin America. But Frontier achieved an operating profit of USD31 million in 3Q2012 and an operating margin of 8% compared with Virgin America’s USD16 million operating loss and 4.3% operating margin, which was a 1.3ppt decline year-over-year. 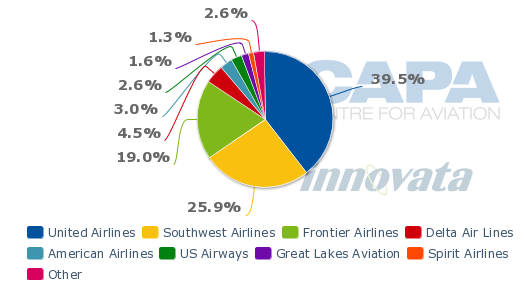 Even though Frontier ranks third behind United and Southwest in terms of seat deployment from its Denver hub, it seat share still represents 19% of the total, well above Virgin America’s share in its major bases in San Francisco and Los Angeles. Frontier also purposely attempts to avoid heavy competition with Southwest, allowing it to coexist with United and offer a lower-fare alternative to capture customers. Virgin America reasons by slowing growth its network investments will mature and result in an improved financial state. But at five years on the carrier has still to record an annual profit, and investors are likely getting impatient for a return on their investment. During its slower growth period Virgin America also needs to carefully examine its network and consider changing course and refining its business strategy to truly force a turnaround in its fortunes.